We've been getting big bunches of arugula in our produce box for the past few weeks. It's on the more mature side so it has a considerably peppery bite to it. 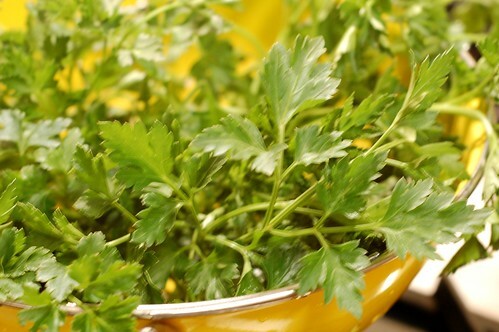 We also got a big bunch of flat leaf Italian parsley - very fresh and aromatic. Served with a green salad (I threw some candied pecans on there for extra crunch and sweetness) and fresh bread with butter, this made a delicious dinner. 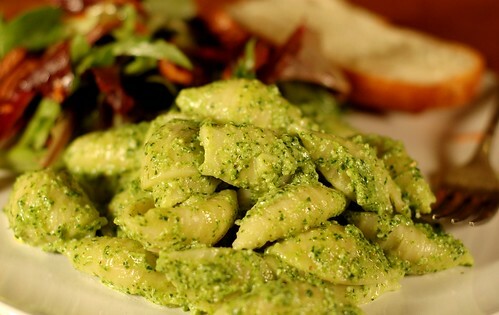 Note that when adding any pesto to cooked pasta it is important to include three or four tablespoons of the cooked pasta water for proper consistency and even distribution. 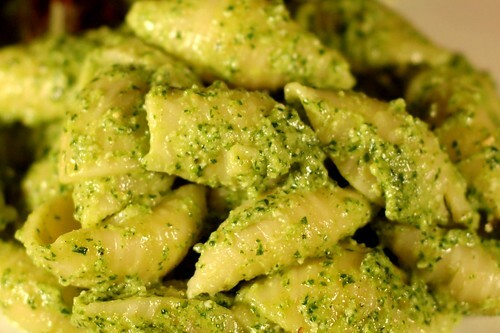 This pesto can be kept in the refrigerator for up to three days if covered with a sheet of plastic wrap or a thin film of oil. 1. Toast garlic in small dry skillet over medium heat, shaking pan occasionally, until softened and spotty brown, about 8 minutes; when cool, remove and discard skins. While garlic cools, toast nuts in skillet over medium heat, stirring frequently, until golden and fragrant, 4 to 5 minutes. 3. Blend the garlic (cut it into a few pieces to make it easier to blend), nuts, arugula, parsley, and oil until smooth in a food processor, stopping once or twice to scrape down the sides of bowl with a rubber spatula. Transfer the mixture to a small bowl and stir in the cheeses. Season to taste with salt and pepper. Sounds like a nice fresh twist on an old classic. I want to try this, but possibly add unsweetened raisins for a bit of a sicilian twist! That looks absolutely delicious! I don't eat dairy though...I wonder what a good substitute for the ricotta would be.